We are pleased to announce that the new ‘Maxol auto24’ fully automatic 24 hour service station opened at 2 Andersonstown Road, Belfast this morning at 11AM. 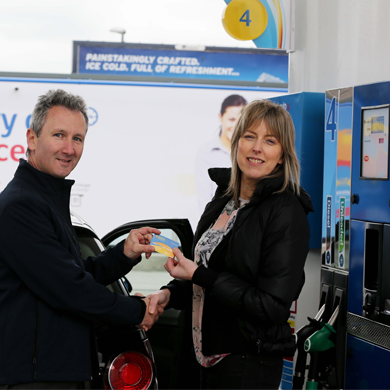 To celebrate the launch the City Beat street team are giving away free fuel throughout the day starting with our very first customer Anne Marie Barr from Belfast who arrived onsite at 11:05am. The Auto24 customer service team will also be on-hand from 7AM – 7PM for the next two weeks to assist customers in using the new ‘Pay At Pump’ facilities. They will demonstrate how the fuel payment process work, register customer contact details for upcoming fuel promotions and can offer customers a complimentary coffee. All customers who register will also be in with a chance to win an iPad!